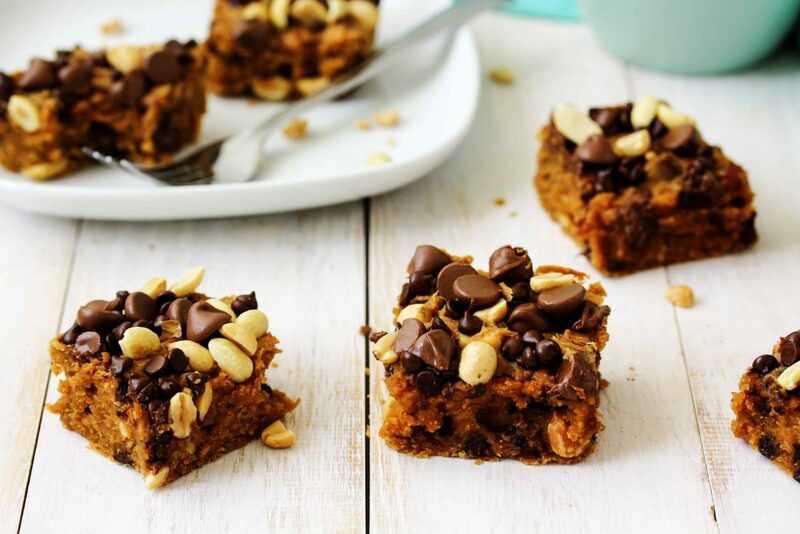 These ultra creamy, healthy peanut butter chocolate chip blondies are sure to be your new favorite snack! 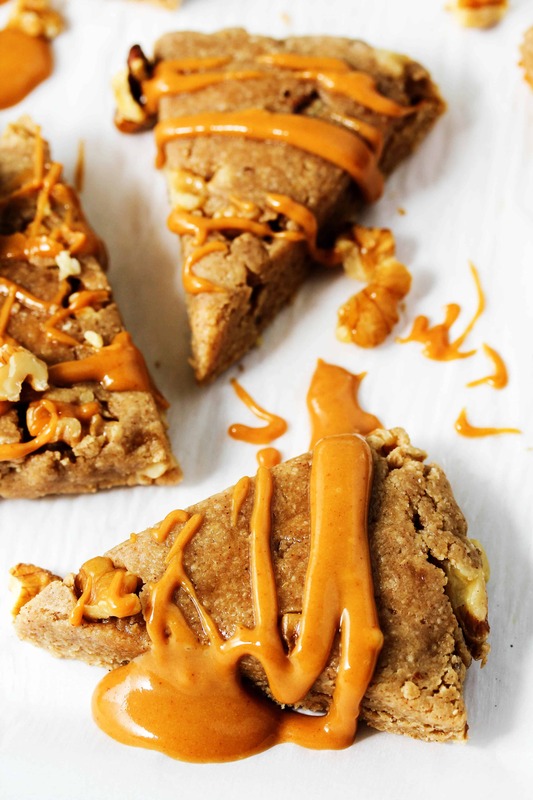 They’re made with whole grains, are low in sugar, and come together in one bowl and all of about 10 min. 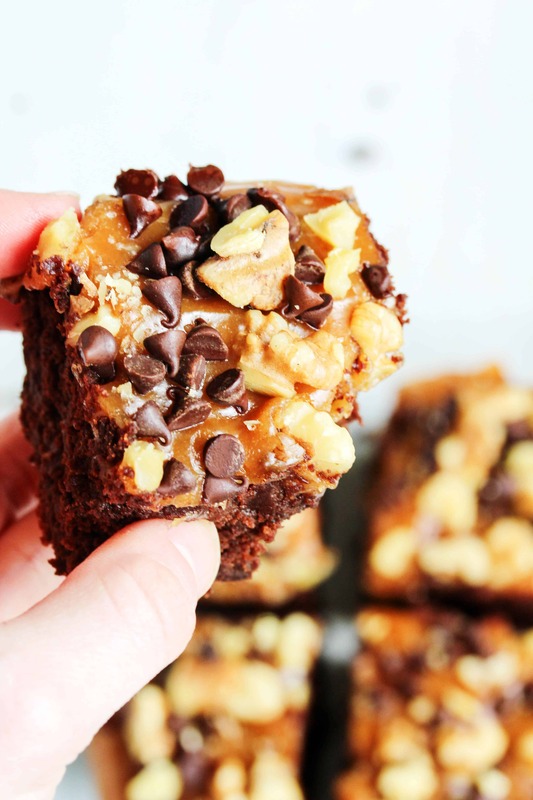 Plus what goes better than chocolate and peanut butter!? 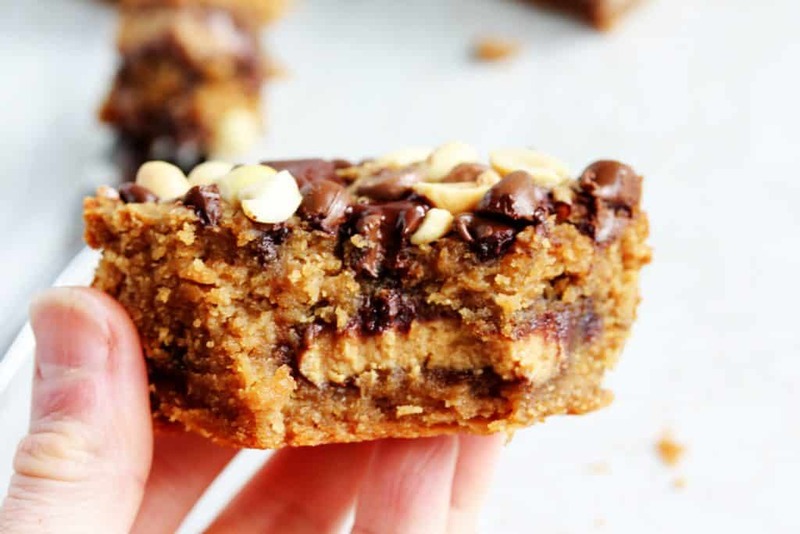 If you like your house to smell ahhhh-mazing, you need to make these healthy peanut butter chocolate chip blondies ASAP. 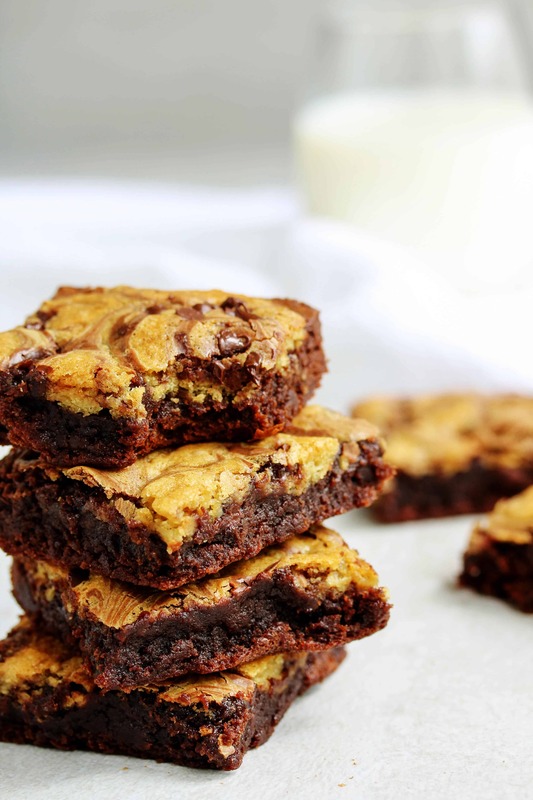 I’m not sure there is anything better than combining chocolate and peanut butter, except maybe the smell that’ll come out of your oven while these creamy, melt-in-your-mouth, blondies are baking. They’re made in 1 bowl in about 10 min. 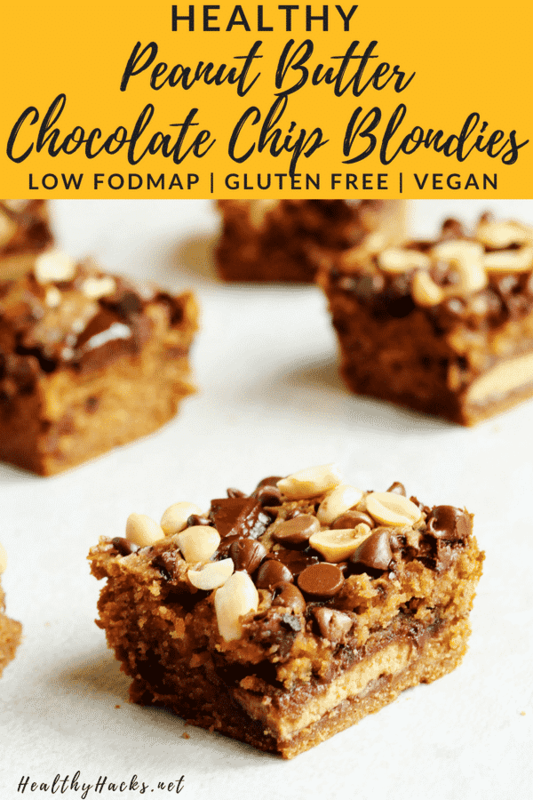 You could say the one thing better than the smell of these scrumptious blondies is how quick and easy they are to make! They only take 9 ingredients (and two of those are water and salt so do they really count….??) and one bowl to whip together. 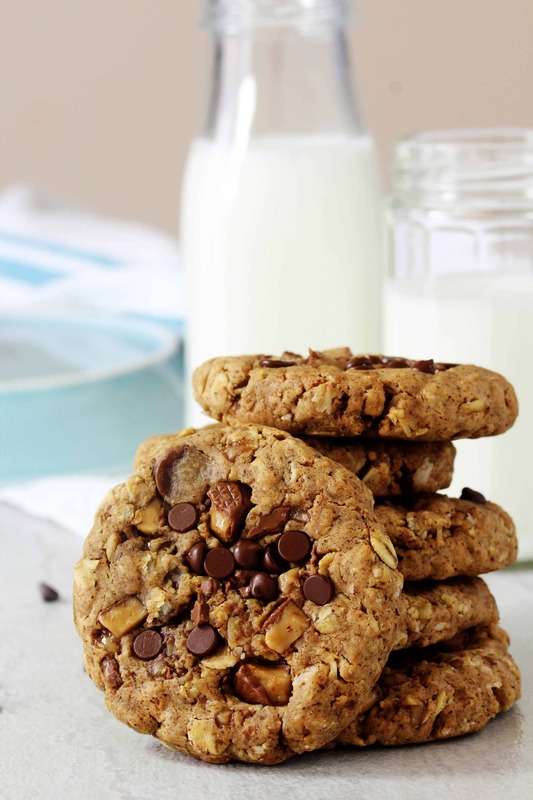 They’re perfect baking for a busy weekday! There’s a lot of focus on what to eat after a workout, but what you eat before a workout is important, too! As tasty as it might be, unless you’re prepping for a marathon there’s no need to carbo-load ;). But, carbs are still important! If you want energy to make it through your workout, carbs are gonna do it for ya! 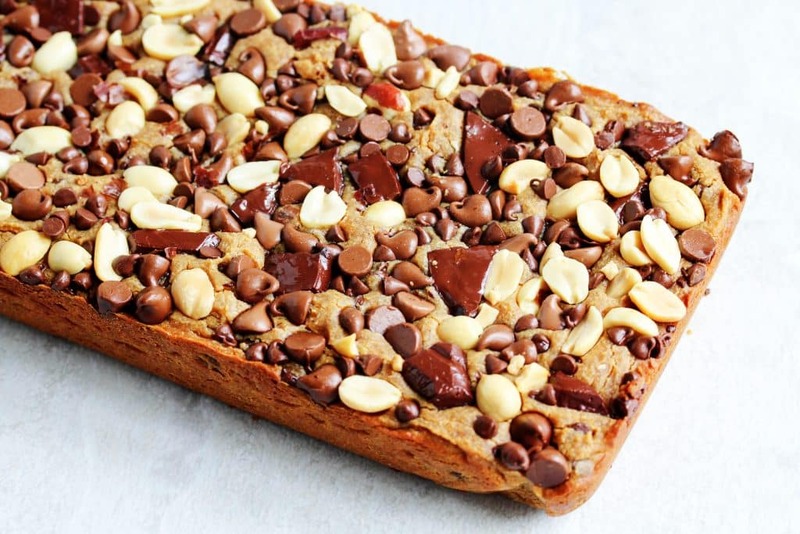 And whole grain carbs (like the oats in these peanut butter chocolate chip blondies) are the way to go because they are digested slowly and give you sustained energy to power you through your workout, like this HIIT workout from Fitness Magazine that I’ve been doing lately! It’s great to do anywhere since it doesn’t use any equipment! 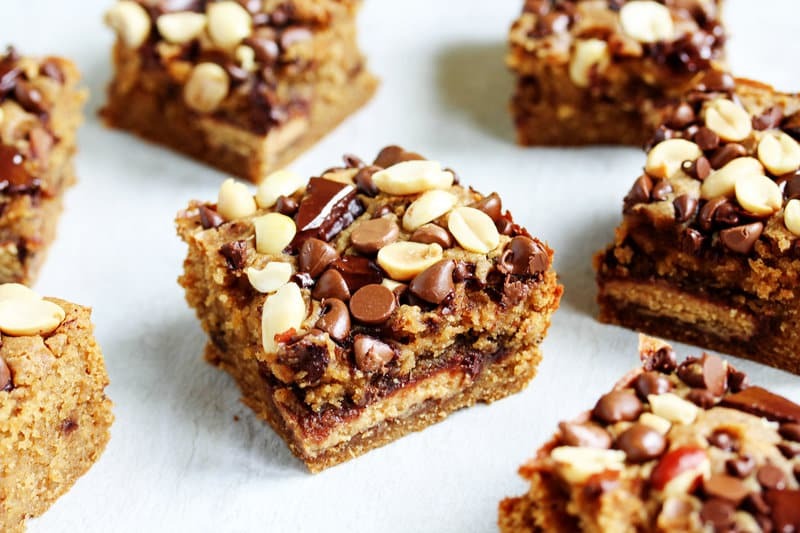 And thanks to the peanut butter and powdered peanuts in these peanut butter chocolate chip blondies I’ve got you covered with that, too! 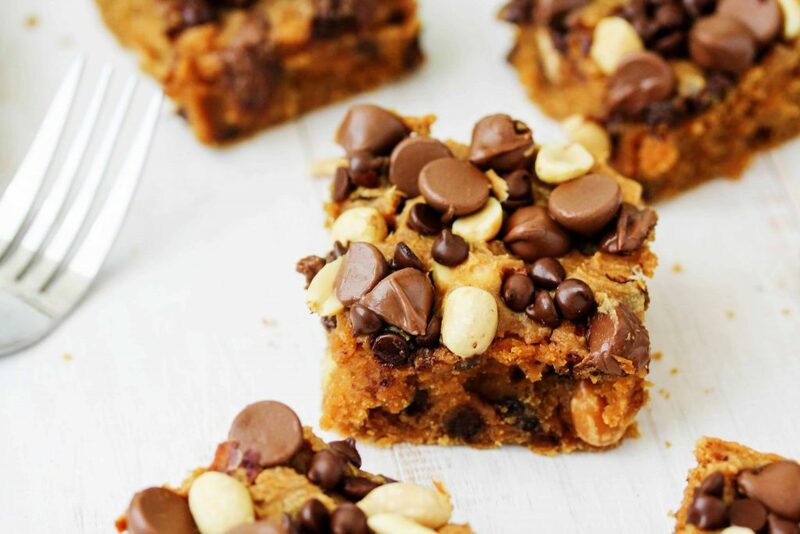 Healthy Peanut Butter Chocolate Chip Blondies for everyone! And be sure to tag me @HealthyHacksRD if you make a batch! I love to see your pics! 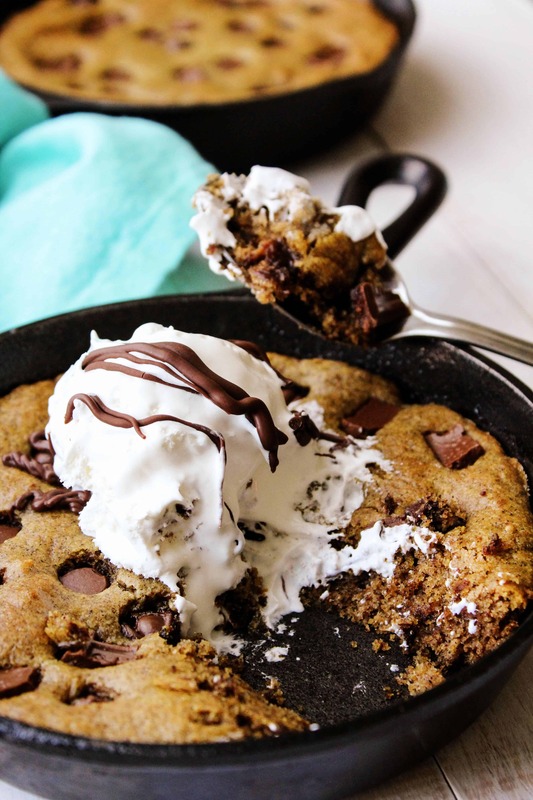 I’m also now on Yummly! You can use the Yum button to save any Healthy Hacks recipe to your personal recipe box! Preheat the oven to 350 F. Line a 9”x5” loaf pan with aluminum foil so that it’s long enough hangs over the edges. In a large bowl, stir together the peanut butter, milk, and water. Add the powdered peanut butter, oat flour, sweetener, baking powder, and salt. Stir until well combined. Fold in the chocolate chips and/or peanuts. Optional – reserve half to sprinkle on top. 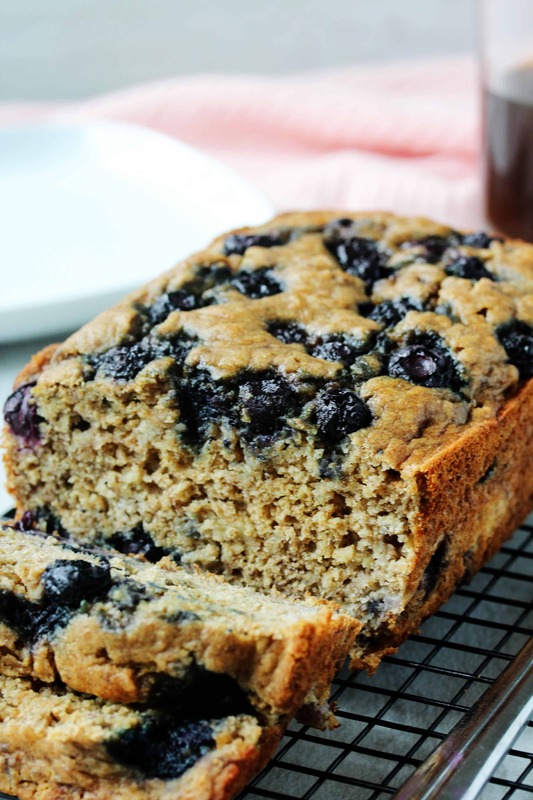 Pour the batter into the prepared loaf pan and spread it out evenly using a rubber spatula. Optional - sprinkle the remaining chocolate chips/peanuts on top. Bake for 17-19 min. or until the edges are set and the center is springy to the touch. Allow the bars to cool slightly (about 10 min.) in the pan, then lift them out by using the aluminum foil overhang. 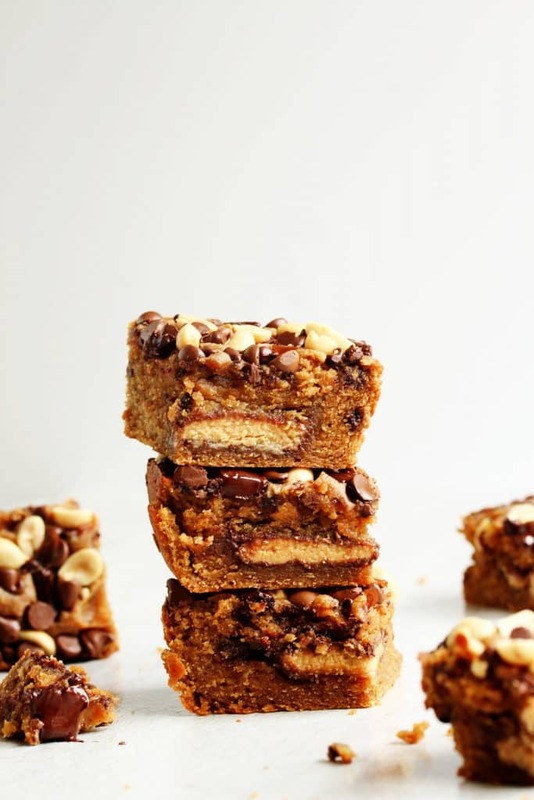 Let the bars cool completely, then slice up your lusciously creamy peanut butter chocolate chip bars into squares and enjoy! 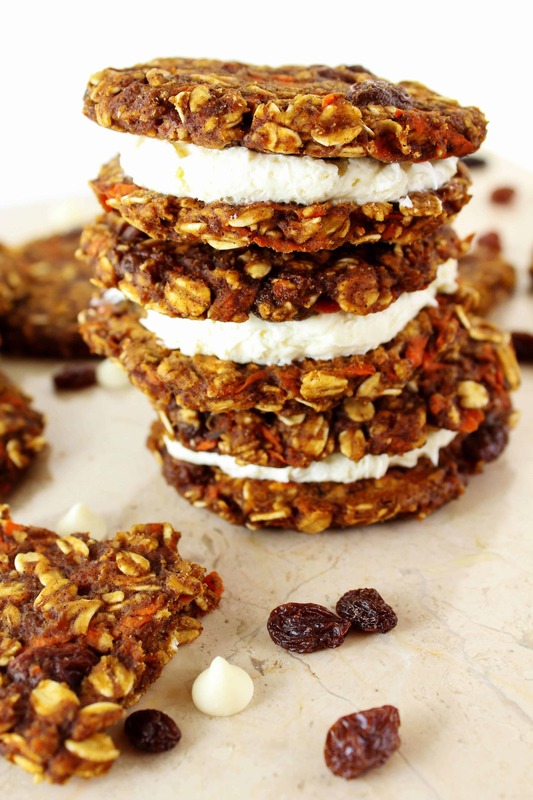 Nothing better than a sweet snack that's tasty AND healthy. Best of both worlds, right? 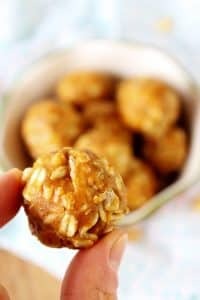 I love snacks like this are healthy but taste like a treat! And peanut butter and chocolate are the best combo ever! 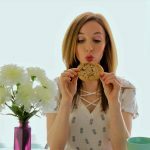 Do you think I could sub almond flour for the oat flour? Hi Vanessa! I think that would probably work. If you try it, let me know how it goes! I just made these! They are super delicious! My husband and I had two and could hardly keep from getting a third. I replaced the peanuts with vegan white chocolate because I didn’t have any peanuts on hand. It was the perfect substitution. Thank you for the best blonde recipe I have tried!! I'm so glad you both liked them, Brenda!! Your comment made my day :D White chocolate does sound like it'd be delicious with these. 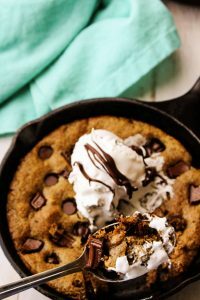 I'm going to have to try that next time I make them! Hey Valerie! With the amount of powdered pb called for in this recipe there's not a great substitution. They do make powdered almond butter now which would probably be the best bet. Some people have had success swapping out the powdered pb for almond flour in other recipes, but the amount was a lot lower. Hope that helps some!